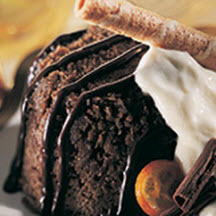 This holiday-elegant chocolate steamed pudding, served with a fluffy, buttery vanilla cream sauce is the combined inspiration of chef Craig Kuenning and Ellie's mom. Melt chocolate with butter over very low heat; cool. Combine sugar, eggs and vanilla; beat well. Blend in coffee. Combine dry ingredients; add to sugar mixture, mixing well. Blend in chocolate mixture. Divide batter evenly among eight buttered 6 ounce custard cups. Cover each tightly with aluminum foil. Place cups in pan with at least 1 inch sides; fill with 1/2 inch very hot water. Cover pan tightly with aluminum foil. Bake in a preheated oven at 350°F (175°C) for 45 minutes. Cool; unmold. Serve warm with sauce. For Ellie's Mom's Sauce: Combine all ingredients except whipping cream; mix well. Beat cream until thickened. Fold in sugar mixture, mixing until well-combined.